What does a film and video editor do? Would you make a good film and video editor? Take our career test to find out how you match with this and over 800 other careers. 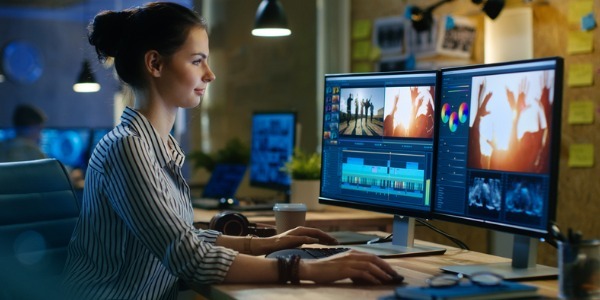 What is a Film and Video Editor? What is the workplace of a Film and Video Editor like? A film and video editor is a highly skilled film industry employee who edits movies or videos. The success or ultimate failure of the production lies in their hands. The final production must be a coherent project that incorporates the storyline and personality of the starring actors. Many in the industry consider film editing to be an art that often goes unnoticed and unappreciated, with some dubbing film editing as 'the silent art'. The history of film editing is a long trek, going back to the early heydays of Hollywood. As technology grew, the job descriptions of film editors expanded, to include the field of video editors. The job duties of film and video editors are numerous. An employee might find himself studying scripts to understand the storyline and collaborating with directors, producers, and film staff regarding the script and director's goals. Throughout the filming, the film editor will examine tapes for editing purposes, looking for errors, segments that run long or parts that do not match the story or go with the storyline. He will work with others adding sounds, voices and music that match the script and place them in the appropriate place. Film and video editors complete these tasks with digital equipment and computer software to create high-quality sound effects. Varying camera angles and shots will be looked at and the best ones added to the reels. The reels will be reviewed several times before the editor comes up with a final version called the director's cut. During the process, he works with other staff including sound and lighting technicians, costume designers and makeup artists, actors, directors and other editors. Making a movie is truly a team effort. The film and video editor’s job has changed over the years. When movies were black and white, editing was simple. With computer and advanced technology, a film and video editor's job became increasingly more complex using computer graphics to aid in editing films and supplying the necessary elements to create the finished product. Are you suited to be a film and video editor? Film and video editors have distinct personalities. They tend to be artistic individuals, which means they’re creative, intuitive, sensitive, articulate, and expressive. They are unstructured, original, nonconforming, and innovative. Some of them are also investigative, meaning they’re intellectual, introspective, and inquisitive. Does this sound like you? Take our free career test to find out if becoming a film and video editor is right for you. Employers for film and video editors include television stations, cable companies, and film and video companies. Another arena of employment is in independent studios. These professionals must be able to work as team players with others in the industry. Fellow employees might include other film editors, sound and lighting technicians, makeup and costume artists, actors, directors and company owners. Although those in this field work as a group, they often find the main portion of their job is performed independently. Film and video editors spend a large portion of time in projection rooms, cutting labs or computer rooms, editing the films alone. Workers in the film industry find that they are sometimes required to work long hours, especially during movie post-production. Those working in TV studios find the work hours are more traditional, putting in a 40-hour workweek.